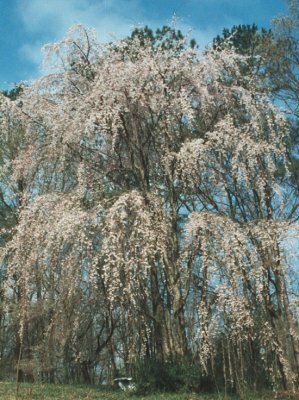 The weeping cherry tree was fashioned by the Earth Mother as a bridal veil for her favorite daughter -- Spring. Lady Autumn was late coming this year, probably pouting over the late Spring and long Summer. But, at last, she made her debut -- teasing and taunting with bright splashes of color sprinkled among the still deep greens of summer. So shyly and demurely she flirts, with her patches of bright ruby leaves and the soft yellows of the red oaks turning to gold even as we watch. What a faker she is, this coy ingénue trying to hide the flashy, bold, brazen hussy that lurks behind a few turning leaves. Then she emerges in a change so swift that the heart stops -- our senses are filled up as the dazzling, iridescent golds, the vibrant reds and rich oranges flash and resound across her canvas. Even the stodgy pines in their continuous green dress are caught up in this gala affair, delighting in their role as they provide the accent and the harmony for her symphony of color. An occasional aged patriarch, leafless and past his prime, presides with dignity over the late summer maidens shamelessly displaying their wares. A symphony of color as this shy ingénue flits here, flits there, sprinkling and gathering her colors for her Spring dress and the Debutante's Ball. The Symphony of Spring continues as the dogwood daughters are in full dress -- the shy ones peeking warily from behind the great oaks in the vales; the brazen ones flaunting their brilliant white blossoms in the full morning sun. The Yoshino cherry trees bid a soft pink farewell as their bright, white blossoms transcend gently into a roseate hue just before they fall in a swirl and sprinkle my walkway like a gentle snowfall. The azaleas noisily compete with one another in their gaudy reds, pinks and whites -- and then the heart stopping sight of a forty foot wisteria vine swaying gently in the wind as it dangles from an accommodating mother pine tree, its lush lavender blossoms capturing and reflecting the soft hues of the setting sun. Spring -- the Earth Mother's finest hour.